A straight forward agreement to arrange for an employee to work in the same way as a commission agent. 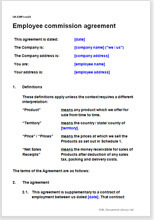 Use as a stand alone agreement or add the text to a contract of employment. You will use this employee commission agreement as supplemental to a contract of employment. Maybe you use a standard version employment contract for all your staff and want to avoid changing it. Maybe you have decided to let one particular employee sell on commission. Maybe you have a union agreement on employment contracts. You can use this supplemental commission contract for any level of employee either ongoing or for a very short term. This document does not affect the employment contract. It is an extra. It stands alone and deals only with matter relating directly to selling.